Gwen Mogenson, Martha Banks, and Elizabeth Mao discuss money transfers at the Aug. 30 Board of Finance meeting in Darien, Conn. 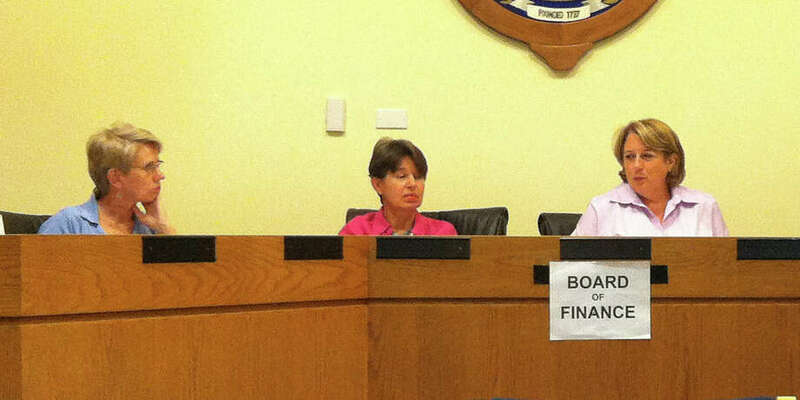 While the Board of Finance approved on Thursday, Aug. 30, $1,044,848 in transfers in the 2012-13 municipal budget, it admonished town departments to do a better job of planning. The board stressed the importance of budgeting properly and following established procedure. The members also warned town departments that if the practice continues, transfers may not be approved in the future. Martha Banks, board vice chairman, asked Finance Director Kathleen Clarke Buch, "What would happen if we denied one of these transfers?" "The people who caused the expenditures would be held personally responsible," Buch said. While some board members disagreed with holding those who spent the money personally responsible, Chairman Elizabeth Mao seemed to think it might be appropriate. "I'd be OK with that if it sent the right kind of message," Mao said. The board considered transfers within departments that exceeded $5,000 as well as transfers from the contingency account for the first part of the fiscal year and then the same for second half of the year. While almost everything on the agenda passed unanimously, there were few items that were approved without a discussion of why the money was needed. Board members could be heard saying on several occasions, "Why wasn't this in the budget for X?" That kind of question arose when the board considered a transfer of $108,974 to pay for police overtime. Some board members wanted to know why there was so much overtime, and while they passed the transfer unanimously, they all agreed that they wanted an update from the police. No one from the department was present to address the overtime issue, but the board requested either a written or in-person report from a police representative at its next meeting. "According to the papers, there's been a lot of police activity, catching criminals. A lot has gone on this summer," Mao said. Board members were particularly upset with a $30,500 transfer request to the Leroy East parking lot. "This one rankled me a bit. This wasn't an emergency repair," member Lorene Bora said. Mao agreed, wondering if the proper approval process was followed to do that paving project. Buch explained that because the paving company was in town, it was decided the job would be done. "Procedures are important. They're there for a reason," Mao said. Banks thought that the damage of the lot was more substantial than what was first expected. Bora was so disturbed by the transfer request, she abstained from the vote. She felt voting `no' would have been pointless, as the lot has already been paved. The transfer was approved 6-0-1. Action on a transfer request of $22,354 by the Police Department for a digital logger system, which would improve the quality of 911 calls, was tabled until the September meeting. "I'd like some more information about this," Banks said. Most of the board agreed. Mao asked why the expenditure wasn't in the budget because the price estimate came in on April 22, during the budget-setting season for the 2012-13 fiscal year, which began on July 1. "It seems to me we have another case here of people thinking about a project, but not budgeting it in, and then coming to us for more money," member Jon Zagrodzky said. Finally, the request to transfer $129,703 for a Leroy Avenue gas line for the Darien shuffle project again prompted board members to question departments' budget planning. Banks wondered aloud, saying, "We're putting it in specifically for this project." Zagrodzky disagreed. "This is a good investment for the town regardless of whether or not it's related to the project at all. There will be aggressive payback for the town." The board agreed the money for the gas line should have been in the original budget for the shuffle project, but the transfer was approved 6-1, with Banks dissenting. The shuffle has been in the works for more than a year and will involve moving the Board of Education office and the senior center. The Board of Education will be moved to 35 Leroy Ave., and the senior center will be moved to the town hall annex and renamed the Mather Center.